Cupanion at UW: Reuse. Refill. Rewards! 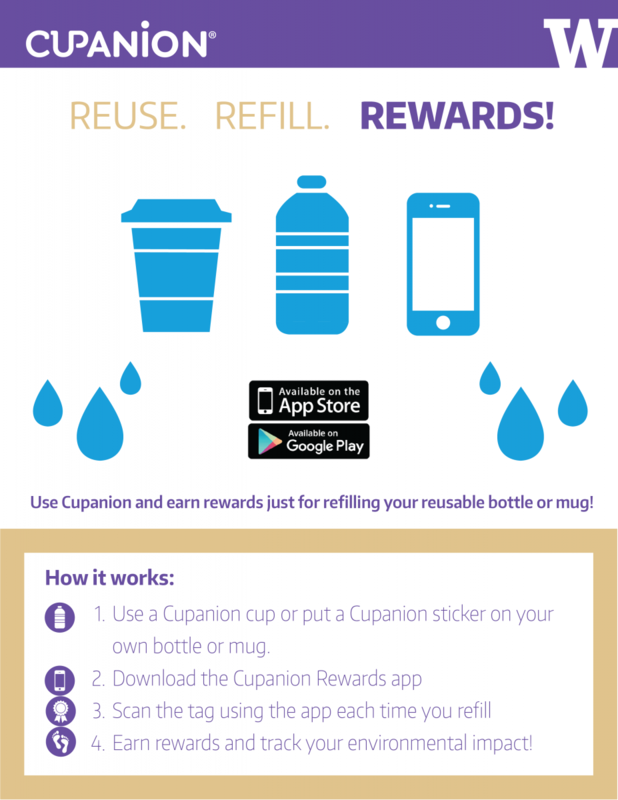 The University of Washington is partnering with Cupanion to reward our community for utilizing reusable mugs! Each time you reuse your cup or mug you are making an environmental impact. With the Cupanion app you can easily track waste diverted, emissions saved, and how much ocean pollution you have prevented. Earn rewards and see your environmental impact! Stickers are available at all UW campuses. UW Seattle: The students groups SEED and EcoReps are distributing stickers. Find UW SEED on Facebook for more details. UW Bothell: Contact uwbsust@uw.edu for information on how to get your Cupanion sticker. UW Tacoma: Look for information about Cupanion stickers on campus.